St Matthew chapters five through seven are referred to as the Sermon on the Mount. Within these 111 verses from the Redeemer of the world is a timeless sermon containing 11 invitations and 16 warnings that are more relevant to us today than when Jesus gave them to His disciples two millennia ago. His invitations are the same to us living today as they were during His mortal ministry. Jesus is inviting us to listen to His words, do what we see Him do and learn about Him so that we can receive eternal life. His warnings advise us on what keeps us from coming unto Him. Consider how much better the homes and neighborhoods we live in would be if more of us lived as the Savior has taught us. His invitation is to all the sons and daughters of God, yet more and more people are failing to develop the intellectual and spiritual understanding of the words of God. This website is intended to help cultivate this within us from three chapters found in the Gospel According to St Matthew. As you look at the following two mental models showing the Sermon on the Mount invitations and warnings to a more excellent way everyday, you will see how specific Jesus is in His teachings to us. 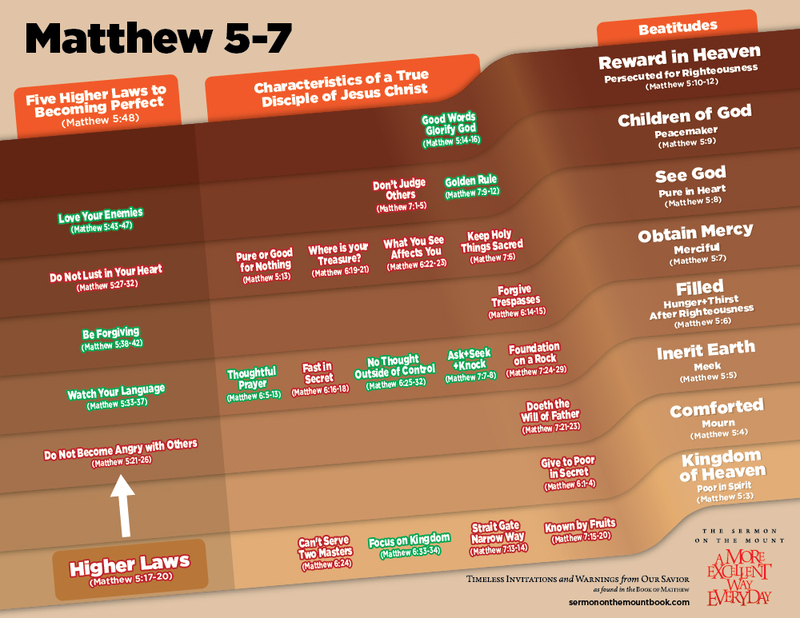 Each model is aligned to the Beatitudes showing how interconnected the verses are from Matthew 5-7. 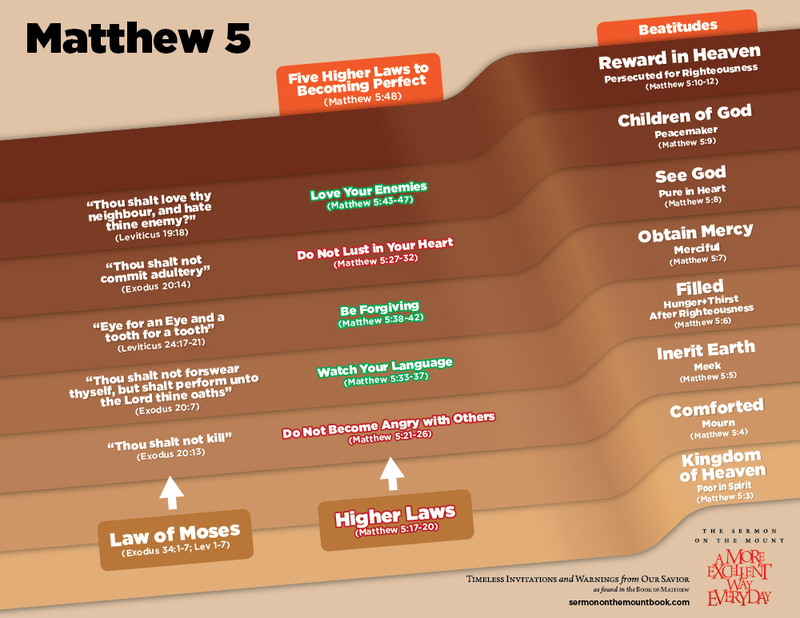 The first model is broken out by the higher laws with the second model represents the characteristics of Jesus Christ. The teachings of Jesus are the sure foundation upon which we should build our lives to weather any storm (see Matthew 7:25). His philosophy of life — His gospel — exceeds all the wisdom of the world, and His teachings bring to the world principles to living a more excellent life which few live let alone many are even considering. To those who ascribe to the philosophies of men, the teachings of Jesus Christ seem like “idle tales” (Luke 24:11). Little wonder then that when Jesus ended this sermon to His newly called disciples, “the people were astonished at his doctrine: For he taught them as one having authority, and not as the scribes” (Matthew 7:28-29). To receive the testimony of Jesus is to hear His gospel, accept His teachings, and integrate His wisdom into our lives so that we begin to become as He is. God has promised eternal life to those who come to know Him by becoming like Him (see John 17:3; Matthew 5:48). 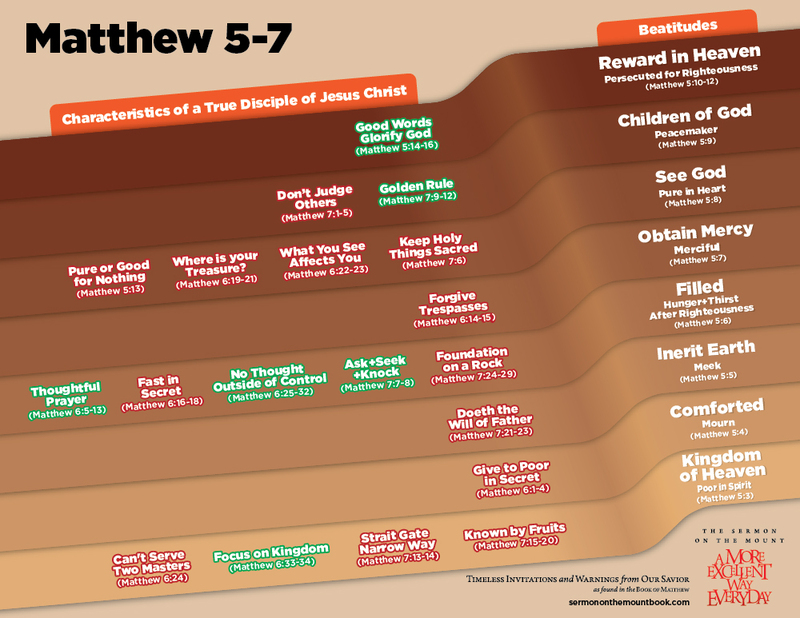 This website provides a visual representation of the Sermon on the Mount intended to help you and me become like Him. Should you see any improvement opportunities on this site, please email them to lorin@sermononthemountbook.com, so I can continuously improve what has become a labor of love since 2011 for our Savior and my brothers and sisters striving to become disciples of Christ.